In our last issue of The Salt Lake City Messenger we pointed out some interesting facts that seem to point to a relationship between the Mormon Church and the CIA. For one thing, we proved that a company which handled international public relations for the Mormon Church was used as "an overseas cover for CIA activities." (Newsweek, July 15, 1974, page 29) This was the Robert R. Mullen and Company. Mr. Mullen is the same man who wrote a book entitled The Latter-day Saints : The Mormon Yesterday and Today. This book is obviously written in defense of the Mormon Church. Robert Bennett, a prominent Mormon who is the son of Wallace F. Bennett, bought the Mullen Co. in 1971. The notorious Howard Hunt worked under Bennett at the Mullen Co. at the very time the Watergate break-in took place. In fact, the Watergate conspirators met and discussed plans for the burglary in the Mullen Co. In April 1970, E. Howard Hunt retired from the Central Intelligence Agency after having served in it for over twenty years. With the help of the Agency's External Employment Affairs Branch, he obtained a job with Robert R. Mullen and Company, a Washington, D.C., public relations firm. The Mullen Company itself had for years cooperated with the Agency by providing cover abroad for Agency officers, carrying them as ostensible employees of its offices overseas. Hunt, while employed by Mullen, orchestrated and led the Fielding and Watergate break-ins and participated in other questionable activities. The Mullen Company had tangential associations with some activities of the White House staff. . . . Robert Mullen had, however, for many years cooperated with the CIA by making some of his overseas offices available at different times as a cover for Agency employees operating abroad. The existence of Mullens' relationship with the CIA was, of course, kept secret to protect the secrecy of the cover arrangements and this led to complications when, after Watergate, the Mullen Company came under investigation. . . . Eight months after Hunt was hired by the Mullen Company, Robert Bennett joined the company. Bennett, the son of Senator Wallace Bennett (R-Utah), had been active in Republican Party affairs . . . His political connections led him to be involved in some of Hunt's later activities, discussed below. . . .
Hunt had dealings with the Agency in the summer and fall of 1971 in connection with the White House projects previously discussed. And he continued to be employed by Mullen, which had a CIA relationship, and to be associated with Bennett in several projects with political or espionage overtones. . . .
During the period preceding Watergate, Hunt continued to be employed by Mullen Co. and was in regular contact with Robert Bennett, its president. Mullen continued to provide cover for CIA officers abroad and Bennett and Hunt had a few meetings with the case officer respecting these arrangements. . . .
At one time Hunt approached Bennett with a proposal to obtain the assistance of the Hughes organization for a burglary in Las Vegas to secure purported information about Senator Muskie. . . .
During this period Bennett was asked by Hughes' attorneys to get a bid for surveillance of Clifford Irving, who was then writing a book describing his earlier preparation of the fraudulent Hughes biography. Hunt got an estimate from James McCord and gave it to Bennett who passed it to the attorneys. They rejected it as too high. Almost from its inception in 1947, the CIA has used religious groups both as a source of information and as a conduit for funds. CIA spokesmen declined to discuss the CIA-church connection in any detail . . .
Sources said the CIA dealt with religious groups in Latin America, Africa, Asia and elsewhere. A spokesman for the Senate select intelligence committee said the panel's staff is investigating complaints that the CIA has had improper dealings with missionaries. Since the Mullen Company [the firm which handled the Mormon Church's public relations] was used as a cover for the CIA, a question concerning the involvement of the Mormon Church with the CIA naturally arises . . . The Mormon Church's world-wide activities and mission program could provide a perfect cover for CIA agents, but at the present time we have no evidence that this is actually the case. We do know, however, that the Church provides many men for the CIA. Writing in the New York Times for September 16, 1974, Wallace Turner states: "Many Mormon scholars work on contracts for the C.I.A." We recently asked a man who had taught at Brigham Young University if he had any reason to believe that the Mormon missionary program is used as a cover for CIA agents. He replied that he did not, but he went on to state that many missionaries are later recruited to CIA work. He felt that the missionary program provided good training for CIA agents. The missionaries are taught absolute obedience to authority and many of them learn foreign languages as well. Thank you for your current "Messenger." As usual it is very informative. I am currently employed with the Central Intelligence Agency and can attest to the fact that the Agency has been very fruitful in hiring Mormons, especially former missionaries. In my section they are four . . . I'm sorry I do not have any vital information other than what I just told you. I would appreciate it if you would keep the above information in your confidence as to not using my name. I do not feel that I have given you any secret information but people can sometimes make something out of nothing. We tried to get this CIA employee to tell us how large his "section" is, but he would not answer. According to the Salt Lake Tribune for June 28, 1975, Mormon Church President Spencer W. Kimball said there are now 20,160 missionaries in 133 missions. It is very unlikely, however, that the CIA would use a large number of Mormon missionaries while they were still serving on their missions. For one thing, most missionaries would be too young to be trusted with such important responsibilities. Then, too, if very many were used, it would soon become generally known and the cover would not be effective. Any Latter-day Saint who denounces or opposes, whether actively or otherwise, any plan or doctrine advocated by the "prophets, seers, and revelators" of the Church is cultivating the spirit of apostasy. . . . Lucifer . . . wins a great victory when he can get members of the Church to speak against their leaders and to "do their own thinking.". . . It would certainly be easy for a Mormon to extend this type of thinking from Church leaders to government leaders. Dr. Maxwell not only serves as Church commissioner of education but as an assistant to the Twelve Apostles. The Salt Lake Tribune for June 7, 1975 said that "He is commissioner of the educational system of the Church of Jesus Christ of Latter-day Saints and an assistant to the Council of Twelve Apostles." Dr. Maxwell worked at the University of Utah sometime between leaving the CIA and accepting his call from the Mormon Church. Some people at the University of Utah seem to have been suspicious that Dr. Maxwell had not completely severed his contact with the CIA. We do not know whether there is any truth to this accusation, however. There can be little doubt that the Church's Brigham Young University provides many men for the CIA. . . .
An expense paid trip to the nation's capital and a monthly salary of $780 from the U.S. Central Intelligence Agency (CIA), provided BYU law student Dale Storer with an "interesting experience" last summer. . . . Storer spent the summer in Washington D.C., doing research for the CIA . . . He said there are many opportunities to work with the CIA and urged students wishing to gain more information to contact Dr. Lawrence G. Woodward, coordinator for cooperative programs.
. . . I did have a professor at BYU who had been first a member of U.S. Army Intelligence (Korean War), and later an employee of the CIA . . . and he never made any secret of it. . . . I also had a roommate at BYU who is now and has been for some time a covert agent (a "007") for the CIA, . . .
After publishing this information we had a very interesting thing happen. The very man who was a "covert agent" for the CIA visited our bookstore. After conversing for some time, he made some statements concerning his friends and travels which led us to suspect that he was the "covert agent" mentioned in the letter cited above. We confronted him with these facts, and he frankly admitted that he was the man. He stated that he had served on a mission for the Mormon Church. Later he worked in the language department at Brigham Young University where he was recruited by the CIA. He served as a covert agent for the CIA, but he was unable to adjust to the double life. He claimed that he finally left the CIA altogether, and he asked us not to reveal his name. He seemed to be disillusioned with both the CIA and the Mormon Church. Although the Rockefeller Report says that the Mullen Co. had "a number of clients having no known relationship to the CIA," it does concede that "various companies who were clients of the Mullen firm may in turn have had relationships with the CIA, . . . (Report to the President by the Commission on CIA Activities Within the United States, pp. 174, 176) In our last issue of the Messenger we stated the belief that at least three clients of the Mullen Co. had some involvement with the CIA. (We feel that this list can be increased to six, and we have deep suspicions about some of the other clients.) Two clients which we mentioned in the last issue were the Mormon Church and Howard Hughes. The relationship between these two clients is a story in itself, but when we add the involvement of the CIA it becomes even more intriguing. Robert Bennett, the Mormon who bought the Mullen Co., is the same man who brought the Hughes account to that firm. On page 176 of the Rockefeller Report we read: "Bennett brought Hughes Tool Company (now Summa Corporation) as a client to Mullen. . . . Later in 1971, he introduced Hunt to representatives of Hughes . . ."
The Times early last month was the first to report that the CIA, using a revolutionary ocean mining craft purportedly owned by Howard Hughes, had recovered a Russian submarine. . . .
Howard Hughes has had two objectives which are of particular interest to us here: First, to establish a relationship with the CIA. Second, to staff his organization with a large number of Mormons. Mr. Hughes seems to have succeeded very well in both areas. The early years of the 7000 Romaine message center brought the Advent of the Mormons. "I think Mormons as a whole have the most integrity of any group of people in the country," Howard told me. "They take care of their own people, and they won't accept help from charity or the government. And I like the idea that they don't drink liquor. You can trust them." The guys you have to talk to are the five who live with him and are the only ones who ever see him. You might as well have a chat with the Sphinx. These guys are hired and paid by Frank W. (Bill) Gay, who was a young Mormon student at U.C.L.A. when Hughes hired him. . . . It was Gay who built up the security capsule that still surrounds Hughes. . . .
Hughes remained isolated on the ninth floor of the Desert Inn throughout everything that went on. The only members of his staff with whom he had personal face-to-face contact were the five secretary-nurses of his so-called "Mormon Mafia." The headquarters, message center and general command post of Hughes' spy network and secret empire is an unimposing two-story beige stucco building in downtown Los Angeles. . . . The Romaine Street headquarters is a nerve center of the finest and most sophisticated electronic equipment available in the espionage field. Various warning devices can spot any attempt to intrude anywhere in the building. . . . The selection of employees to work in the building involves more screening and investigation that [than ?] the CIA uses in selecting its agents. . . .
An asphalt parking lot on one side of the building is staffed by expressionless young Mormon men. There are noticeable bulges under the arms of their jackets. . . .
Summa Corp. is the financial umbrella under which most of Hughes' worth is contained. . . . Most recently, another Summa "asset" hit the news: the $350 million Hughes Glomar Explorer vessel that Hughes built at the behest (and the expense of) the Central Intelligence Agency . . .
Nearly all of Hughes' holdings are under the Summa corp. umbrella. . . . Its board of directors (Hughes is not a member) consists of Frank W. (Bill) Gay, . . . Chestor Davis, . . . Nadine Henley . . . and John Holmes and Lester Mylar, two of Hughes personal assistants who remain with him and who are among the few individuals who see him face to face. A native Provoan who works in top positions in the Howard Hughes organization will speak on campus Thursday. Frank William Gay, executive vice president and chief executive officer, director and chairman of the executive committee of the Summa Corp., will be the guest speaker at the Executive Lecture Series, . . . The reader will notice that Mr. Gay is "on the board of directors and vice-chairman of the executive committee of the Polynesian Cultural Center in Hawaii." This is very interesting because the Salt Lake Tribune for Nov. 15, 1970, states that the Mormon Church's "Zions Security Corp. . . . is owner and manager of the Village of Laie in Hawaii, . . . and the Polynesian Cultural Center." Kay Glenn, whom Time Magazine for Jan. 24, 1972, identified as one of the "Mormon Mafia," now serves as "a vice president of the Summa Corp." (Salt Lake Tribune, April 4, 1975) According to the New York Times for March 27, 1975, it was Mr. Glenn who had custody of the memo which told of the CIA's involvement in the Glomer Explorer project. On November 14 the unseen Howard Hughes turned 180 degrees and gave authority for Maheu to be ditched. . . . Davis, with Bill Gay in tow, descended on Las Vegas with a small army of auditors and set up battle headquarters in the Sands Hotel. . . . Meanwhile, even more ominous rumors began to circulate about the health and safety of Hughes himself. In Las Vegas a sheriff's party, saying it had information of foul play, broke into the Hughes penthouse, searched it, but found nothing. Hughes's Nevada lawyer, Tom Bell, called a press conference to put on record his belief that Hughes would not willingly leave Nevada "without notifying his personal attorney." He wondered aloud whether Hughes was still alive. . . .
After two members of Hughes's hitherto anonymous palace guard, Howard Eckersley and Levar Mylar, appeared at the court, it was fairly clear that rumors of Hughes's death had been much exaggerated. But how alive he was, was still in dispute. It emerged that Hughes had been given a series of blood transfusions several weeks before his trip to the Bahamas and that he had been suffering from pneumonia and anemia. . . . Since the time Howard Hughes was spirited away from Las Vegas, there has been a growing concern that he might be dead. On Jan. 7, 1972, a man who claimed to be Hughes gave "a telephone interview with seven West Coast journalists sitting in a Los Angeles hotel room." This interview convinced many people that Hughes was still alive. NEW YORK (AP) — Two Manhattan stockholders have filed suit contending that Howard R. Hughes is dead. . . . The civil complaint in state Supreme Court alleges that while Hughes is reputed to be residing at the Hotel Xanadu in the Grand Bahamas, he "has been dead for a considerable period last past" and is claimed to be alive "for the personal profit of various and sundry persons." The contention that the billionaire is dead was denied by Hughes spokesman Richard Hanna in Los Angeles. . . .
"The man—as far as we know—has no children. We don't even know if there is a will," Bader said. "Nobody has seen him for 10 years or more. Unless it can be proved otherwise, he is either dead or incompetent and the burden of proof must rest with Mr. Hughes or those acting in his behalf." NEW YORK (AP) — A judge on Friday dismissed as "an exercise in futility" a suit calling upon billionaire recluse Howard Hughes to prove he is alive or be declared legally dead. Now that the close ties between Howard Hughes and the CIA have been revealed, there will probably be even more speculation that he is "either dead or incompetent" and that his empire has fallen into the hands of the "Mormon Mafia" or the CIA. We have almost completed our new book, Mormon Spies, Hughes and the CIA. In this book we will deal extensively with such subjects as: the Mullen Co. and the Watergate break-in, the BYU spying operations, the prostitution conspiracy and the Church, wiretapping and bugging, Mullen and the Mormons, Mormons and the CIA, Robert Bennett's involvement with Hunt, Hunt's BYU spy, Bennett's cover-up, Mormons and Hughes, assassination plots, Intertel, Interprogres, the possible existence of the secret Council of 50 in the Church, Bennett's dummy milk committees, and many other important subjects. In our book Mormonism—Shadow or Reality? Chapter 22, we show that the original papyrus from which Joseph Smith "translated" the Book of Abraham was rediscovered in 1967 in the Metropolitan Museum of Art. Egyptologists translated this papyrus and found that it was an Egyptian funerary text known as the "Book of Breathings." This is a pagan text which has absolutely nothing to do with Abraham or his religion. Dr. Nibley wrote a series of articles which lasted for over two years in the Improvement Era—from Jan. 1968 to May 1970. Although he used almost 2,000 footnotes, he never did translate the papyri. In the Salt Lake Tribune for Nov. 11, 1973 we criticized Dr. Nibley for not producing a translation of the papyri. He replied that he had prepared a book which was 800 pages long: "It is all about the 'Book of Breathings' and is 800 pages long, but that is not enough to account for keeping the impatient Tanners waiting for six years. What took up all that time was having to find out about a lot of things." (The Salt Lake Tribune, Nov. 25, 1973) This book, which many people believed would answer the objections of the critics and save the Book of Abraham, was finally published by the Church's Deseret Book Co. in 1975. Dr. Nibley's book, The Message of the Joseph Smith Papyri: An Egyptian Endowment, will certainly prove to be a disappointment for those who hoped he could save the Book of Abraham. Answering your letter dated August 19, 1975, the writings of Dr. Hugh Nibley concerning the papyri scrolls have been done entirely on his own responsibility and do not have the official approval and sanction of the Church. The brethren appreciate your interest and asked me to extend to you their best wishes. At any rate, the reader may order Dr. Nibley's new book from the Deseret Book Store, 60 East South Temple, Salt Lake City, Utah. Although this book is nicely printed and bound, the contents are very disappointing. Of the 11 fragments of papyrus which were discovered, 10 of them contain significant Egyptian messages which can be translated. We would expect that any book about the papyri would at least have a translation of all 10 pieces. Dr. Nibley's book, however, only contains a translation of 2 fragments! Dr. Nibley has now had photographs of the papyri for almost 10 years, and yet he has only provided a translation of 2 fragments. Among the fragments which Dr. Nibley has not translated is the original of Fac. No. 1 in the Book of Abraham. This fragment contains a number of lines of hieroglyphs which tell what the drawing is about. The reason Dr. Nibley has not translated these lines is obvious: they show that Fac. No. 1 is not a picture of "Abraham fastened upon an altar" as Joseph Smith proclaimed, but rather a picture of an Egyptian by the name of Hor being prepared for burial (see Mormonism—Shadow or Reality? page 347). Those of us who have purchased Dr. Nibley's writings in the Improvement Era, the BYU Studies and now his new book have spent at least $30.00. What do we have to show for this investment? We have hundreds of pages of material with thousands of footnotes, but we have a translation of only 2 of the fragments of papyrus and no answer to the main problems about the Book of Abraham. Is the Book of Abraham a correct translation of Joseph Smith Papyri X and XI? No, the Book of Breathings is not the Book of Abraham! . . . Doesn't the text of the Book of Abraham appear in a number of manuscripts in columns running parallel with characters from the Book of Breathings? Yes, the brethren at Kirtland were invited to try their skill at translation; in 1835 the Prophet's associates, miffed by his superior knowledge and determined to show him up, made determined efforts to match up the finished text of the Book of Abraham with characters from the J.S. Papyrus No. XI; . . .
Now, when we understand that Joseph Smith believed the Book of Abraham was written on a different roll of papyrus than the Book of Joseph, it becomes clear that he was referring to the collection of papyri in general and not specifically to the Book of Abraham. That Joseph Smith did in fact choose the papyrus identified as the Book of Breathings as the source for his Book of Abraham is established by irrefutable evidence. To begin with, Joseph Smith used the drawing at the beginning of the Book of Breathings roll as Facsimile No.1 for his Book of Abraham. It does no contain red ink and the workmanship appears to be no better or well-preserved than that found on Papyrus XI. This in itself would completely destroy Dr. Nibley's argument, but the evidence becomes even stronger as we look into the matter. The writing in the columns to the side of the fragment used for Fac. No.1, which Dr. Nibley does not dare to translate, mentions that the papyrus was made for Hor, and this is the same name mentioned in the Book of Breathings text which follows on Papyrus XI. Second, even Dr. Nibley has to admit that before the papyrus was cut Papyrus XI followed immediately after Fac. No.1 on the roll: "It can be easily shown by matching up the cut edges and fibers of the papyri that the text of the Joseph Smith 'Breathing' Papyrus (No. XI) was written on the same strip of material as Facsimile No. 1 and immediately adjoining it." (The Message of the Joseph Smith Papyri, page 13) On page 3 of the same book Dr. Nibley has to admit that even Joseph Smith's own scribes felt that the text of the Book of Abraham followed right after Fac. No.1: "Since this is an illustration to the Book of Abraham, it has naturally been assumed that the text that follows the drawing could only be that of Abraham—even the brethren at Kirtland assumed that." The strongest evidence that Joseph Smith believed that Papyrus XI was the Book of Abraham is found in the fact that the characters from this fragment were used in the translation manuscripts. Dr. Nibley's suggestion that this was only the work of his scribes is absolutely preposterous. That Joseph Smith would allow his scribes to copy the characters from the wrong papyrus into three different manuscripts of the Book of Abraham is really beyond belief. A person might almost as reasonably conclude that the Book of Abraham itself was made up by Joseph Smith's scribes. All evidence, then, points to the unmistakable conclusion that Joseph Smith believed that Papyrus No. XI was the Book of Abraham. This papyrus has been translated by qualified Egyptologists and found to be nothing but the Book of Breathings—a pagan text. Even Dr. Nibley has to admit that Papyrus XI contains "the directions for wrapping up the Joseph Smith papyri with the mummy. . . ." (Ibid., page 6) Fortunately, Nibley has included a translation of this fragment in his new book. His work agrees in substance with the translations we have published in Mormonism—Shadow or Reality? page 317. In fact, Dr. Nibley includes the names of many pagan gods in his translation of the Book of Breathings. Dr. Nibley cannot find anything about Abraham in this text, but to soften the disappointment he tries to relate it to the Mormon temple ceremony. Why he would want to equate the Egyptian religion with Mormonism is really a mystery to us. The Egyptian religion is so filled with magic and other pagan practices. In this book Mr. Marquardt's research has been meticulous and the evidence of his contention infallibly documented. . . . The original ancient Egyptian papyrus from which Joseph Smith claimed to have "translated" the Book of Abraham in the The Pearl of Great Price, has been found and is now in the possession of the Latter-day Saint Church. From my own translation of the hieratic text, substantiated by the translations of other responsible Egyptologists, the fraudulent nature of the Book of Abraham is obvious. . . .
Dr. Hugh Nibley, . . . has recently published a book . . . in which he denies that the Hor Sensen Papyrus is the original from which Smith made his so-called translation. The L.D.S. Church has in its possession three separate "translations" written by two of Smith's scribes, at his dictation, which prove that these are the documents Smith used. Mr. Marquardt effectively proves the reality of this fact. The "Word of Wisdom" is a revelation which was given to Joseph Smith on Feb. 27, 1833 (see Doctrine and Covenants, Sec. 89). It forbids the use of hot drinks (tea and coffee), strong drinks and tobacco. Although most members of the Church feel that Joseph Smith, the founder of the Mormon religion, "carefully observed the Word of Wisdom," research reveals just the opposite. In fact, Joseph Smith, the man who introduced the Temple Ceremony into the Mormon Church, would not be able to go through the Temple if he were living today because of his frequent use of alcoholic beverages. Joseph Smith's History of the Church certainly provides evidence that he continually broke the Word of Wisdom. Although a number of references concerning Smith's disregard for the Word of Wisdom have remained uncensored, the Mormon leaders have made three important changes in Joseph Smith's History of the Church (see Mormonism—Shadow or Reality? pp. 6-8). In one instance, Joseph Smith asked "Brother Markam" to get "a pipe and some tobacco" for the Apostle Willard Richards. These words have been replaced with the word "medicine" in recent editions of the History of the Church. At another time Joseph Smith related that he gave some of the brethren "a couple of dollars, with directions to replenish" their supply of "whisky." In modern editions of the History of the Church, 23 words have been deleted from this reference to cover up the fact Joseph Smith encouraged the "brethren" to disobey the Word of Wisdom. In the third instance, Joseph Smith frankly admitted that he had "drank a glass of beer at Moessers." These words have been omitted in recent editions of the History. On another day he [Joseph Smith] recommended that Jacob Zundall and Frederick Moeser, who were known to drink ale, wine, and other spirits, be called on missions to Germany. Brother Moeser was held responsible for the disturbance of a crowd in front of his combination grogshop and grocery. A foreign mission would strengthen his testimony. But before departing he was fined $3 for breach of the temperance ordinance. . . .
To his varied roles of restorationist, revelator, seer, prophet, translator, elder, high priest, apostle, president, editor, Bible redactor, temple-builder, and the more mundane roles of land-agent, merchant, and banker, Joseph now added innkeeper, lieutenant-general, Mason, judge, mayor, candidate for President of the United States, and husband of more than two score wives. . . . Did such a man have time to drink? The sophisticate might well ask: Under the weight of such unlikely banners how could he desist? But the larger question persists: Was Joseph's conduct exemplary? Being so constantly exposed before his people how could he have fooled them? Apostle Amasa Lyman thought perhaps not all were fooled. He told fellow-Apostle Abraham H. Cannon: "Joseph Smith tried the faith of the Saints many times by his peculiarities. At one time, he had preached a powerful sermon on the Word of Wisdom, and immediately there after, he rode through the streets of Nauvoo smoking a cigar. Some of the brethren were tried as was Abraham of old." William [Law], Joseph's counselor in the First Presidency from 1841 to 1844, broke with his leader in opposition to polygamy. . . Dr. Wyl obtained this succinct statement from Law . . . in 1887: "I only saw him drunk once. I found Joseph and Hyrum at a place where they kept quantities of wine. . . . I remember that Joseph drank heavily, and that I talked to Hyrum, begging him to take his brother away, but that was the only time I saw the prophet drunk.". . .
Joseph's associates sometimes spoke of his paleness when "in vision" or when receiving a revelation. A daughter of Adaline Knight Belnap recorded her mother's impression of the Prophet in an instance of spiritual (spirituous?) passivity. "How well she remembers one day before her father died (Vinson Knight) of a little excitement in school. The children were busy when the school room door was carefully opened and two gentlemen entered, carrying the limp form of Joseph Smith. The children all sprang to their feet, for Brother Joseph lay helpless in their arms, his head resting on his brother's shoulder, his face pale as death, but his eyes were open, though he seemed not to see things earthly. The teacher quieted them by telling them that Brother Joseph was in a revelation, and they were carrying him to his office above the school room.". . . Most critics were less charitable than Adaline and unwilling to attribute paleness to revelation. To to Latter-day Saint the Temple is the place of highest communion with God. The sacred edifice built by the Saints at Kirtland, Ohio between 1833 and 1836 was the first of many Temples. . . It is ironic that the aura of holiness surrounding the opening of this sacred shrine should be sullied by charges of intemperance against the Elders of Israel during the week of priestly rites following the dedication. . . . Beginning January 28, 1836, as hosannas filled the nearly completed building, pillars of fire were said to rest on the princes of the Church. . . . A mighty angel with flaming sword was seen riding on a horse of fire. Five more fiery horses mounted by sword-wielding angels encircled the house, breaking Satan's power and protecting the Saints. Some of the baneemy (spiritual name for "mine elders" in Doctrine and Covenants 105:27) had glorious visions, some spoke in tongues, and some prophesied of great things in store for Zion. There were footwashings and anointings and partaking of the bread and wine. . . . This was but a prelude to the great jubilee and time of rejoicing during the dedication week of March 27. . . Elder George A. Smith, . . . arose and began to prophesy . . . Suddenly a noise was heard like the sound of a mighty rushing wind filling the Temple. The congregation simultaneously arose as though moved by an invisible power and began to prophesy and speak in tongues. . . . "And I beheld the Temple was filled with angels," reported the Seer, "which fact I declared to the congregation.". . . The fever and excitement mounted as the services moved toward midweek. Joseph had promised the Saints a veritable Pentecost, and by Wednesday, when attendance was restricted to the male membership of the Church, nearly five hundred Melchizedek and Aaronic priests closeted themselves in a session that lasted throughout the night. . . . Joseph recorded that "it was expedient for us to prepare bread and wine sufficient to make our hearts glad, as we should not, probably leave this house until morning; . . . The stewards passed round and took up a liberal contribution, and messengers were despatched for bread and wine.". . . "The brethren began to prophesy upon each other's heads," continued the Prophet, "and cursings upon the enemies of Christ, who inhabited Jackson county, Missouri; . . .
"The brethren continued exhorting, prophesying, and speaking in tongues until five o'clock in the morning," the Prophet reported. . . . It was a Pentecost and an endowment indeed, . . . the occurrences of this day shall be handed down upon the pages of sacred history, to all generations; as the day of Pentecost, so shall this day be numbered and celebrated as a year of jubilee, and time of rejoicing to the Saints of the Most High God." . . . The cursing of the ungodly at the Kirtland Temple dedication was strong meat for some of the neophyte priests. "The Entablature of Truth" [George A. Smith] had something to say about it nineteen years later in the Tabernacle at Salt Lake: "The Lord did actually reveal one principle to us there, and that one principle was apparently so simple, and so foolish in their eyes, that a great many apostatized over it, because it was so contrary to their notions and views. It was this, after the people had fasted all day, they went out and got wine and bread, and blessed them, and distributed them to the multitude, that is, to the whole assembly of the brethren, and they ate and drank, and prophesied, and bore testimony and continued so to do until some of the High Council of Missouri stepped into the stand, and as righteous Noah did when he awoke from his wine, commenced to curse their enemies. . . . You never felt such a shock go through any house or company in the world as went through that. There was almost a rebellion because men would get up and curse their enemies; although they could remember well that it is written that Noah cursed his own grandson, and that God recognized that curse to such an extent that, at this day, millions of his posterity are consigned to perpetual servitude.". . . Professor Turner, . . . wrote in 1842: "In 1836, an endowment meeting, or solemn assembly, was held in the temple, . . . The day was spent in fasting, prayer, and other ceremonial preparation . . . They first broke their fast, by eating a little light bread and drinking freely of pure wine, which they were assured would not hurt them, since it had been consecrated to the Lord. . . . A marvellous spirit of prophecy soon ensued, as might have been expected, which vented itself mainly in blessing their friends and cursing their enemies, in which latter class, the clergy of the day and the Missouri mob received their full share. An eye-witness informed the author that he never imagined that language more awful could be used in the world of despair . . . For several days, and even for weeks, they went from house to house, feasting and prophesying, blessing and cursing, as the occasion might require, until the 'triumphs of faith' were fully achieved, . . . others thought it the spirit of delusion, darkness, and error.". . .
Two former high-raking Churchmen, Benjamin Winchester and the contumacious Apostle, W. E. M'Lellin, offered striking details in their disclousures of the Temple raptures. . . . Winchester visited Utah in 1889 and gave a candid two-column report on early Church history to the Salt Lake Tribune. Regarding the Kirtland affair he was unsparing: "That ceremony ended in a drunken frolic, one of the worst I ever saw. . . . Joseph Smith became beastly intoxicated, and his father and his brother Hyrum begged that the wine should be taken away, so that the carousal might be stopped as soon as possible. I did not know Joseph to be what is termed 'a common sot,' but that was not the last time I saw him intoxicated.". . . .
Apostle M'Lellin, . . . had been numbered among the Twelve, . . . His remembrance of the Temple was detailed and unvarnished: "About five hundred ministers entered the great temple about sunrise and remained fasting until next morning sunrise, except a little bread and wine in the evening. The Twelve were required to take large servers and set glasses of wine and lumps of bread and go through the house and serve the brethren. . . . I did my part of the serving. During the night a purse was made up and a wagon sent to Painesville and a barrel of wine procured, . . . All the latter part of the night I took care of Samuel H. Smith, perfectly unable to help himself. . . . And I had others removed from the house because they were unfit to be in decent company.". . . In a statement published in the True Latter-Day Saints' Herald, official organ of the Reorganized L.D.S. Church M'Lellin reiterated his protest: "As to the endowment in Kirtland, I state positively, it was no endowment from God. Not only myself was not endowed, but no other man of the five hundred who was present—except it was with wine.". . .
M'Lellin's disillusion was paralleled by David Whitmer's. . . . The longest-lived of the eleven men who testified to the sacred origin of the Book of Mormon, Whitmer remained true to his original testimony even though abandoning the faith. . . . Whitmer . . . made this statement when he was eighty-one: "The great heavenly visitation . . . was a great fizzle. The elders were assembled on the appointed day, which it was promised would be a veritable day of Pentecost, but there was no visitation. No Peter, James and John, no Moses and Elias put in appearance. I was in my seat on that occasion and I know that the story sensationally circulated, and which is now on the record of the Utah Mormons as an actual happening, was nothing but a trumped-up yarn. I saw a great many of these things which I knew were not right, but I clung on in patience, trusting everything eventually would be put right." That the appearance of Heavenly beings at the Temple may have been purely subjective is suggested not only in Whitmer's statement but from others who, though present, did not attain that effulgence of spirit necessary for celestial sight. . . . The reader will find more on the subject of drinking in the Kirtland Temple in Chapter IV of Hearts Made Glad. Wine and dancing parties were not all confined to the Masonic Hall; at Nauvoo some were held in the nearly completed Temple. A week before the dedication on April 23, 1846 Samuel Richards, another faithful diarist, noted that after the carpenters swept up their shavings "It was voted that Bro. Angel go and inform the Trustees that the hands were ready to drink the Barrell of Wine which had been reserved for them." The painters continued their work until the evening of April 29, when a group of the workers and their wives met in the attic and "had a feast of cakes, pies, wine &c, where we enjoyed ou[r]selves with prayer, preaching, administering for healing, blessing children, and music and Dancing until near Midnight. The other hands completed the painting in the lower room.". . . In Hearts Made Glad, LaMar Petersen presents a great deal of revealing information concerning Joseph Smith's "barroom" his sale of "spirituous liquors" and the question of his own excessive use of alcoholic beverages. Mr. Petersen has a very scholarly and honest way of dealing with his materials. We have a great deal of respect for him, and we must admit that his constant help and encouragement have had much to do with the success of Modern Microfilm Co. The research he has done has had a real effect upon our lives and upon our work. 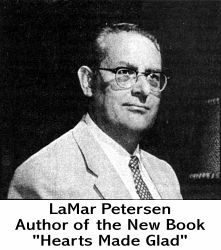 Mr. Petersen's earlier booklet, Problems In Mormon Text, is certainly one of the best works on the subject of Mormonism. In a letter dated Feb. 24, 1958, John Blackmore, who was General Church Historian of the Reorganized Church of Jesus Christ of Latter Day Saints, made this comment: "I thank you for the two books 'Problems in Mormon Text.' I find that the contents of your book and the interpretations of the text, demand a re-evaluation of the incidents of our religious theories and practices." We feel that all those who are interested in Mormon history should have a copy of LaMar Petersen's new book Hearts Made Glad. This paperback book has 258 pages and is beautifully printed and illustrated. I am a convert to the LDS Church, joining when I was 19 years old . . . My husband joined the church a year later, in 1961. I have been a member of the Church now for 15 years and I am presently a visiting teacher and Primary secretary. Over those 15 years I have had to admit to a lot of unhappiness and lack of fulfillment. There were, of course, weeks at a time when I felt close to the Lord and got alot out of Church; but for the most part I have to admit to a growing restlessness and a feeling of frustration. In 1966 ______ and I were sealed in the Oakland temple, along with our three daughters. I was disappointed in the temple ceremonies and left with a throbbing headache, several hours later. I have been to the temple four or five times since then . . .
One year ago a couple moved next door to us, . . . She was very religious and as we talked I expressed to her my prayer failure and general frustration at not being able to have the real power of the New Testiment church in my life. And, yet I knew that I had the true church. This led to more frustration and confusion. I went a few times with her to her church, . . . I loved their worship and saw how much they really did love the Lord. Sitting in our own meetings, especially Sacramento Meeting, hearing talks of food storage, travelogs, etc., but never hardly hearing the word of God preached made me feel even worse. My neighbors had gone . . . for five months on a job . . .
Then, our neighbors returned . . . Again, I saw the glow in her face and wished that I could have what she had. Why did she have such happiness, and extraordinary answers to her prayers, etc. Here I had the true Gospel of Jesus Christ and she didn't and she was getting all the blessings. I felt cold and dead inside. I started going with her to her servi[c]es again once in a while. It was then that I really got desperate. I wanted to be happy so badly. I prayed to God that he would reveal the truth to me, reveal his will, in a manner that I could not mistake. I didn't care how much it cost me or where the chips fell. I just wanted to be on His side, no matter what . . . Nothing particular happened for about a week. I kept telling myself that I wasn't going to worry about it because the Lord would take care of my problem. I kept telling myself that I had to learn to "wait patiently on the Lord." Well, then my neighbor borrowed your book, "Mormonism—Shadow or Reality?" from a friend of hers in her church, and I saw it laying on her bedroom bureau. She was embarrassed and said she wasn't trying to offend me but just wanted to find out more about my religion. I told her she wasn't going to find out much reading anti-Mormon books. But, I did agree that I would be happy to discuss any of our religious doctrine with her husband. I knew I could ably defend my religion as I was well versed in it. I wasn't worried at all. I decided to debate on a particular subject and started doing research. Then I decided I'd better know what the opposition was so I borrowed the book from her. Well, I spent almost three days and nights reading. The adjectives used in the back of your book such as "devast[at]ing" and "utterly crushed" were so true!! My husband and I spent days discussing what the book had brought to light, at first not believing, then not wanting to believe. Could it be possible that we had been decieved? How could it? I asked the Lord to confirm that this was, in fact, an answer to my prayer. . . . Within an hour, I received an unmistakable confirmation from a completely different source. I was scared and yet happy . . .
We are now in the position of having to face reality, but not knowing exactly what to do about it. I have resigned as Primary Secretary and both of us have thrown our garments away . . . We know in our heart that what you have written is true. I, of course, checked in all the books which we have in our home, on the correctness of your quotations. They were all correct. . . . In the preface of your book, you quote a letter received from a member of the Church in Arizona dated July 28, 1965. He states that your book . . . would do more harm to the church than any other volume published in the last 50 to 75 years and that it could tear the church apart. We have to agree. We have read anti-Mormon books before without it having any effect on us. They were written by non-Mormons who obviously didn't have anything going for them but opinions and statements from people who were enemies to the LDS church in its early history. Big deal! But . . . your book condemns the church by using our own history and statements from our own presidents . . . It is truly a startling revelation!